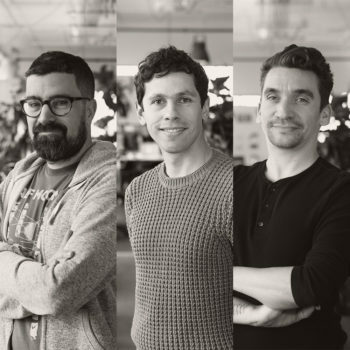 Sylvain Dumais, Armando Gomez and Bruno Ribeiro are multimedia directors at Moment Factory. With backgrounds in a wide range of creative techniques and disciplines, each draws from a deep toolbox of audiovisual practices to shape memorable immersive experiences. As multimedia directors, they conceptualize the creative vision and audience experience of Moment Factory projects and work closely with the studio’s multidisciplinary in-house team to realize them. Their work takes many forms: overseeing show design for concerts, crafting an enchanted world for a night walk or producing high-impact visual content for a signature show. Together and separately, they have contributed to some of Moment Factory’s most spectacular projects, for clients including the NFL, Madonna, Tiesto, Arcade Fire, LAX Airport, Royal Caribbean and Justin Timberlake and Jay-Z.